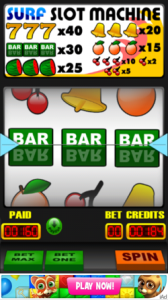 This is the original Surf Slots game – a basic Slot machine for IOS devices. It suffers from a lack of retina (HD) graphics, no iPad support and relativelly poor choices for monetization (bad enough to stop the app getting approved by Apple in some cases). Its more or less a “what NOT to do” with reskinning games. We reskinned this game for a client recently, adding retina (HD) graphics, added full iPad (even iPad retina) support, and importantly changed the monetization model that not only is a much more rewarding and fun experience for player, but one that will likely make more money as well. Please don’t think I am being too harsh on this game, at some point it may have actually worked from a monetization view point, but its pretty clear the person who added the monetization has given no real thought about the players experience, and that is a terrible mistake. 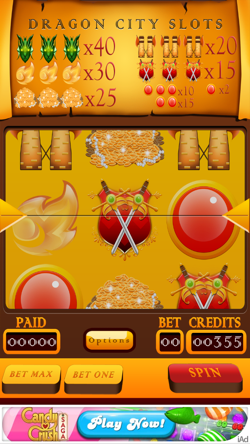 This is our reskin, Dragon City Slots. Never forget in this business that your audience plays the games you reskin and upload, if your focus on what you are getting out of it, as opposed to ensuring an ongoing and fun game for the player, you will get told in no un-certain terms, by your players what they think – They will un-install/not play the game, and for you that means no income. It is possible to have a game that plays well, keeps players entertained and can make you money as well. You just have to think a little bit about this. Do you like ad’s yourself? If you find the experience bad (playing the game) its likely a player will as well. What makes you think a player will hang-around and play your game if its full of ads and a bad playing experience? Guess what? They won’t! Take a look at the video below where I go into this in much more detail. If you want to see this in higher resolution, click the Youtube link at the bottom right of the video. Previous Post What To Do When Your Reskinned Game Goes Live Into The Apple App Store Next Post Can Reskinning Become A Bad Thing?